What Are the Side Effects of Taking Liquid Iodine Kelp? What Are the Benefits of Taking Sea Kelp Tablets? Thyroid dysfunction is a common health problem among Americans, especially American women. The National Thyroid Institute states that millions of people in the United States have been diagnosed with thyroid conditions, including underactive thyroid and overactive thyroid. The Institute also notes that up to 50 percent of depression may be caused by thyroid conditions. Ask your doctor about the risks, benefits and limitations of kelp in treating your thyroid problem before using this natural substance. One of the most significant thyroid problems is underactive thyroid, or a thyroid gland that does not create enough thyroid hormone to match your body's needs. The Consumer Reports website states that approximately 10 percent of women over the age of 60 have this health problem, and that the No. 1 cause of under-active thyroid is an autoimmune condition known as Hashimoto's disease. If you have an underactive thyroid gland, you may experience fatigue, depression, constipation, cold intolerance, joint pain, muscle pain and dry skin. Kelp is a type of algae that thrives in coastal waters throughout the world. Kelp, commonly known as seaweed, grows extremely quickly -- up to several feet per day. This plant contains abundant quantities of numerous nutrients, including beta-carotene, iron, tryptophan, calcium, magnesium, folate, and vitamins A, B-1, B-2, B-3, C, D, E and K. Kelp is most well-known for its significant iodine content. Kelp contains about 415 micrograms of iodine per serving. Many people use kelp as a salt substitute. 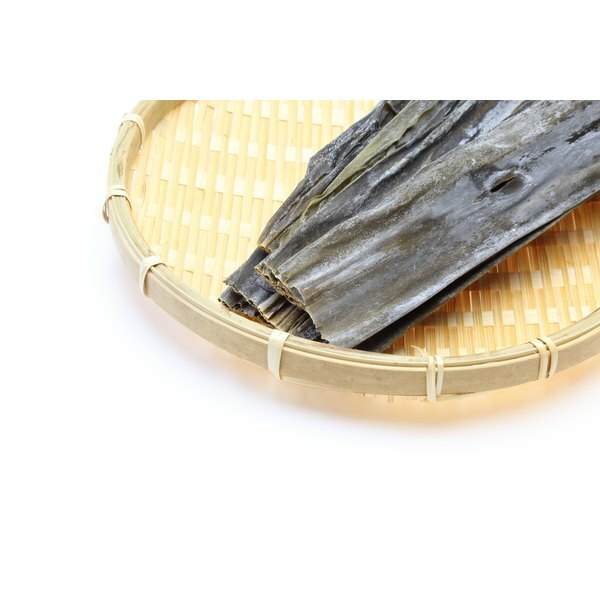 Kelp has been used in treating certain thyroid problems. In his book "Plant Medicine in Practice," herbal medicine expert and naturopathic doctor Bill Mitchell states that kelp may be useful in treating underactive thyroid, particularly caused by lack of iodine and underactive thyroid associated with enlargement of your thyroid gland. Mitchell notes that a dosage of six kelp capsules per day may help boost your low thyroxine -- a thyroid hormone -- levels. Always review the safety, efficacy and proper dosage with your doctor before using this natural substance. Thyroid problems may best be managed by a licensed health care professional. If you experience the common signs and symptoms of a thyroid problem, including symptoms associated with underactive thyroid, contact your doctor as soon as possible to be properly diagnosed and treated. Though kelp may be helpful in treating some thyroid conditions, it may cause serious unwanted health effects in people who have hyperthyroidism, or overactive thyroid. Kelp and other supplements should always be used with the utmost caution. Is Kelp or Dulse Higher in Iodine?